JeepForum.com > General > General Discussion > Can you Name this Tool? Axle Gear Ratio: How do you find this out? Can you Name this Tool? MikeyDeezy Sez...Take ‘er E-Z and Keep it Breezy! Recovery: strap, front d rings, front chevy two hooks, mile marker winch. If we’re going in that direction...Ironman’s Cockring-Trapeze-Swing...Green is for the Envy. Well if the John Deere green plug wrench doesn't give it away, I don't know what will. But I still wouldn't trade it for a Coupe DeVille." It does look like a home brew lifting jig. I didn't see any bolt holes in the end pads on the pole. Are there any? The wrench looks like the cheapo free bee spark plug wrench that came with my lawn tractor, complete with the hole to stick a screwdriver through when the plug is in too tight. The socket wrench has 1-7/16 on it, so it’s pretty large. Maybe Chris87xj is on to something with the John Deere Green. 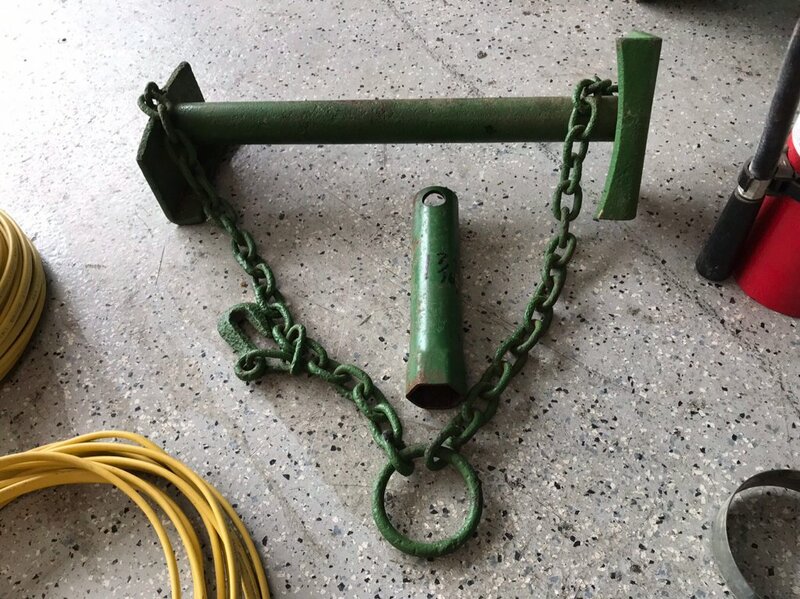 Farm Equipment?